Apple picking might be an old, traditional pastime, but it’s an activity that has stood the test of time and is still hugely popular in the modern day. From generation to generation, American families have always loved heading out to nearby fruit farms and apple orchards to enjoy some apple picking fun together. Many apple orchards offer fully free admission and low prices on bags of apples, allowing you to stock up on your favorite varieties for less. That way, you’ll always have a lot of tasty snacks at home and can start trying out some new apple-based recipes too. New York State is known as one of the very best areas for apple picking in all of North America, with plenty of highly rated apple orchards and fruit farms situated throughout the Hudson Valley. The apple is actually the official state fruit of NY, with dozens of different varieties being grown all around the state and lots of super apple picking opportunities for all the family to enjoy. 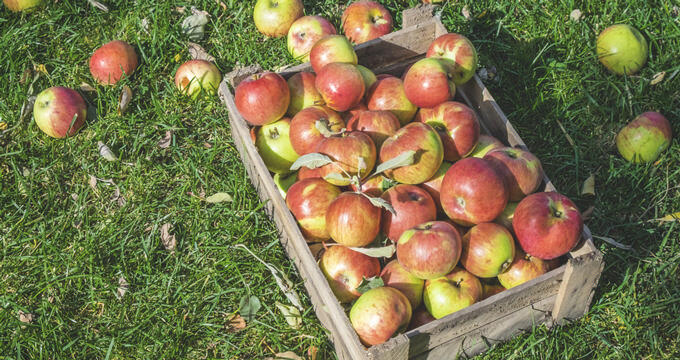 Many of the Hudson Valley’s top orchards open their gates during apple picking season to welcome locals and tourists, and many of them also offer lots of extra activities like hayrides, corn mazes, and special harvest or Halloween festivals. When apple picking season arrives in New York State, it’s not uncommon for many groups of friends and families to spend their weekends driving out to some Hudson Valley orchards and farms to do a bit of apple picking. Some of the tastiest apples in the country can be found in the Hudson Valley, and there are a lot of different apple picking spots to choose from. Read on for full contact details and overviews of the Hudson Valley’s top apple orchards and farms. Out in Rockland, this Hudson Valley apple picking location opens its gates at the state of September and stays open until there are simply no apples left to pick. With over 55 acres of land and more than 4,000 individual apple trees to enjoy, apple picking season is a real adventure at Dr. Davies Farm. More than a dozen different varieties are grown on this land, including all the classics like Empire, Red Delicious, and McIntosh. Visitors can choose between two different bag sizes, depending on group size and how many apples you want to take home, and the orchard is pet-friendly too, so if you want to bring a furry friend along for a nice day out, this is a good place to go. Dr. Davies Farm opens up from 10am to 4pm, but the farm store is open a little longer each day and sells apples as well as other fresh produce and treats. Wilkens Fruit and Fir Farm is situated in Westchester, with apple picking season starting in August and lasting all the way through to the end of the year. Christmas trees can be found in December, but before we get there, there are a whole lot of apples to pick at this beautiful Hudson Valley location. In fact, more than a dozen different varieties are grown at Wilkens Fruit and Fir Farm. Peaches and pumpkins can be picked here as well, and the local farm store sells a wide range of country-style gifts and delicious homemade goods like donuts and cookies. It’s definitely worth stopping off at the store before you leave in order to purchase a few scrumptious souvenirs to really make your day extra special, and the staff at this location are incredibly friendly. Also situated in Westchester, Harvest Moon Farm & Orchard is one of North Salem's premier apple picking locations. The likes of Crispin, Golden Delicious, Red Delicious, and McIntosh apples can be picked here, and the site can get very popular due to all the extra activities and special events like live music, harvest festival weekends, pony rides, face-painting for the kids, and more. This Hudson Valley orchard is open from 10am to 5pm on most days through the apple picking season, and admission is usually free but may come at a small cost if there's some kind of event going on, so it’s a good idea to check the official website in advance or simply call up the farm and see what’s happening before you head out there.